Would You Be Happy To Hand Over £60,000 To The Taxman? 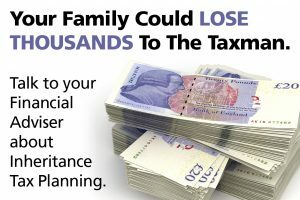 If you don’t do anything about Inheritance Tax Planning this could happen, and much more than £60,000 could go to the taxman, instead of your family. Imagine this scenario. You invested £100,000 and it grew by 50% in 7 years. You would feel pretty happy now that your investment is worth £150,000. The next day the investment is cashed in but you only get £90,000. What could have happened? The answer is you died and your beneficiaries had to pay £60,000 to the taxman in Inheritance Tax. If the total value of your house, other properties, assets, investments and savings amounts to more than the Inheritance Tax threshold of £325,000 your family will have to pay 40% tax on any amount above the threshold. At Four Oaks Financial Services our Financial Advisers in Tamworth and surrounding area are fully qualified to give advice on Estate Planning. In the scenario it would have been possible to invest the £100,000 so that it wouldn’t be liable to Inheritance Tax. Make the most of the financial planning opportunities available and speak to your Financial Adviser.